Would you like to offer your pupils an opportunity to try fencing, to practise it on a regular basis or even to take part in tournaments? What ever your needs are, we can help. 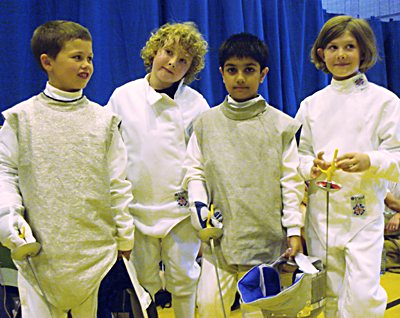 London Fencing Club offers curriculum based lessons, after school clubs and summer courses. We have been running fencing classes in London schools for many years and happy to provide excellent references. Fencing can contribute to a child’s physical, psychological, intellectual and social development. It's a fun and sociable sport which still carries notions of honour, chivalry and nobility. There’s history too. Many famous names have been outstanding fencers. Amongst them Caravaggio, Voltaire, Byron, Marx and Churchill - the latter was the winner of the British Public Schools Championships. Fencing is an inclusive sport. The best fencers are not necessarily the most athletic children; those who show themselves to be courageous, enterprising and motivated can also enjoy it and succeed. Fencing requires discipline and can also teach young people to channel aggression and energy in a constructive way. We recommend groups of up to 12 children of a similar age. If your school has a big sports hall, you might be able to have a larger group which will reduce costs per child. Boys and girls can fence together. We will provide each pupil with the basic fencing kit, consisting of a foil, a mask, a fencing jacket and a glove. Alternatively, if you have the budget to buy the equipment, we can help you to find good quality kit at a competitive price. Our instructors have £5m public liability insurance and recent DBS checks. Usually the cost per child would be in the region of £5-10 per session. Smaller groups might result in higher costs per child. We also have to charge more if the school is far away from central London. If you want to make a first step into the world of fencing please fill in the short form below and we will contact you.